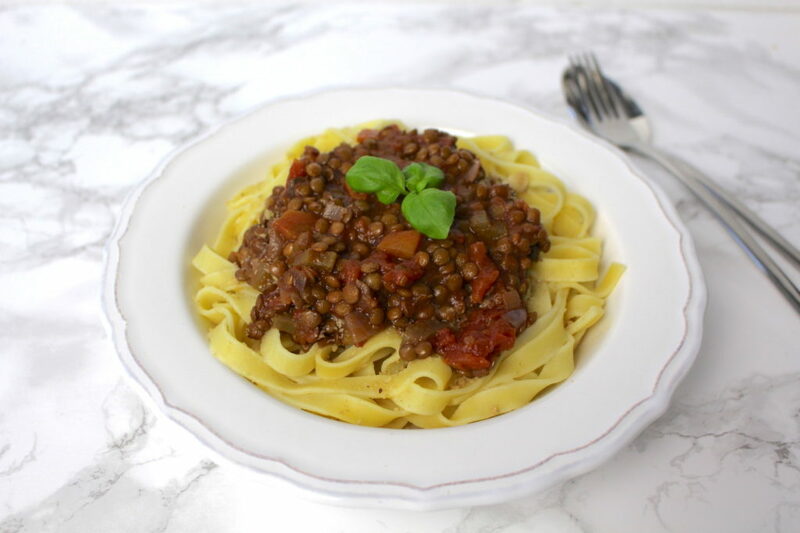 This vegan bolognese sauce with lentils comes pretty close to the original recipe – it’s made without meat but with lots of love, good ingredients and the necessary time it takes to develop the aromas. Huh..in the end, I only substituted the meat for a plant-based ingredient: lentils. I hope no nonna from Bologna feels offended by my vegan bolognese recipe. At least I know (since a few days ago…) that you don’t eat bolognese with spaghetti in Italy as you would anywhere else in the world. Instead Italians have it with tagliatelle or as lasagna. Oh and I may or may not have added a few button mushrooms… At long last, I think different variants of classics are absolutely alright, after all tastes differ, too, right?! 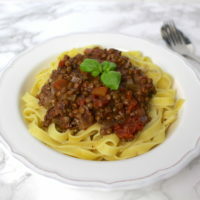 These vegan bolognese with lentils comes very close to the original the origianl recipe – it’s made without meat but with lots of love and good ingredients. Finely dice vegetables: onion, celery, carrot and mushrooms (if using). Heat olive oil in a pan and sauté veggies for a few minutes, then deglaze with a good dash of red wine after about 10 minutes. Add lentils, tomatoes and veggie stock, cover with a lid and let simmer on a low heat for about 1.5 hours. Stirring occasionally, adding some more liquid (veggie stock), if necessary. Finally add a dash of milk or cream (optional) and season to taste with salt, pepper and any other spice you like. Cook pasta according to packaging instructions and serve with bolognese, fresh basil and vegan parmesan. I hope you love this recipe – please let me know in the comment section below! If you make this bolognese, make sure to take a photo and share it on my Facebook page or on Instagram, using the hashtag #minamadefood. Oh and don’t forget to tag me (@thisisminamade) so that I can see your creations!